706 Union Avenue, Memphis, Tennessee is the street address of one of the most famous rock 'n roll locations in the world, Sun Studios. Memphis is filled with legendary music locales like Beale Street and Graceland, but only one spot marks the place where rock was born. Visit Sun Studio today for the opportunity to stand at the very microphone where Elvis Presley became the King of Rock 'n Roll. Sun Studio can legitimately claim to be the birthplace of rock 'n roll. After producer Sam Phillips opened the business in 1950 as the Memphis Recording Service, Sun Studio hosted hundreds of legendary recording sessions including Jackie Brenston and Ike Turner's “Rocket 88”, the song considered by many to the first rock 'n roll single. At Sun Studio you'll be able to step into the recording room where history was made and the front office where secretary Marion Keisker “discovered” a young Elvis Presley. Sun Studio became a crossroads of every important style of music of the day from R&B to country and blues to rockabilly. Jump ahead to 1954 and imagine the sound of “That's All Right (Mama)” played by Elvis Presley, Bill Black, and Scotty Moore bouncing off the Sun Studio walls. At Sun Studio will get you a peek into the past where Elvis took rock 'n roll to new heights with “Blue Moon of Kentucky,” “Good Rockin' Tonight”, and “Mystery Train”. 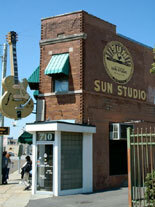 In addition to Elvis Presley, Sun Studio hosted sessions with great artists like Howlin' Wolf, B.B. King, and Charlie Rich. Johnny Cash and the Tennessee Two perfected their freight train sound at Sun Studio which is recognizable in smash hits like “I Walk The Line” and “Folsom Prison Blues”. Roy Orbison punched his Sun Studio ticket to fame with the rockabilly standards “Go! Go! Go!” and “Rockhouse”. Jerry Lee Lewis and his “Pumping Piano” rocked Sun Studio on sides such as “Whole Lotta Shakin' Goin' On” and “Great Balls of Fire”. And Rufus Thomas recorded an answer song to “Hound Dog” with his blockbuster hit, “Bear Cat”. During the Sun Studio tour, you'll learn of and hear a selection from the famed Million Dollar Quartet session in 1956 where “Blue Suede Shoes” rockabilly singer Carl Perkins was joined by Elvis Presley, Jerry Lee Lewis, and Johnny Cash for a series of impromptu recordings. You'll stand where these legends stood in that historic day. The Sun Studio building closed up as a studio in 1969, but after a 16 year layoff, the studio reopened for recording business in 1985 and later hosted modern day bands like U2 and their tribute to American music, “Rattle and Hum” from 1988. Sun Studio is not just a rock 'n roll museum and a National Historic Landmark. Today, it's a working recording studio which hosts sessions from wide variety of musicians. Recent performers have included The Walkmen, The Watson Twins, and Grace Potter & The Nocturnals. A Sun Studio tour will also give you access to a vast display of memorabilia which traces the history of the Memphis Recording Studio and Sun Records. Also, enjoy a quick snack or cold drink in the nostalgic Sun Studio Soda Shop and browse the great merchandise available for purchase to commemorate your visit. No trip to The River City is complete without taking home a copy of Elvis Prelsey's “Sun Sessions” on CD and a Memphis Recording Service t-shirt from the Sun Studio gift shop. No other recording studio in America can claim so much history as its own.